The 2009 Honda Pilot nicely embodies traditional SUV themes in a package that looks more compact than it actually is and manages to convey an approachability and friendliness lacking in its competitors. Shame it's just a little boring. Everything a family needs and more laid out in an intuitive but very buttony way. Plenty of space for eight, although full-size adults may not jump at the opportunity to spend time in the way back, with the middle row pulled forward, they'll fit just fine. The trunk is cleverly configured, offering below-floor storage for wet and dirty stuff and a cargo shelf for items that need to remain easily accessible. With the seats folded down completely flat, there's room for a stack of full-sized plywood sheets to lay completely flat. The 250bhp V6 is fun to use and delivers more acceleration than its drivers are likely to need. The variable cylinder management has the ability to switch between 3, 4 or 6 cylinders seamlessly and is not noticeable in its use, except in the engine's ability to deliver decent mileage for the form factor. More than enough for even hard driving and repeated use, which is more than will likely ever be asked of it. The Hill Start Assist keeps you from rolling backwards on even the steepest of slopes. Firm yet compliant, the Pilot's stiff body is an excellent starting point from which its suspension can work exactly like it's supposed to. Surprisingly fun to drive for an SUV of this size, it's competent both off-road and on. We were surprised by just how well it carved canyon roads and took to the rocky trails above them. We wouldn't want to go mudding in one, but the Pilot is more than capable of accessing remote campsites. And we had fun sliding all over dirt trails with the Variable Torque Management locked into 70%-of-torque-to-the-rear mode. The five-speed auto works best with overdrive off, but otherwise performed as it should. There's no low-range transfer case, but the Variable Torque Management does a surprisingly good job of helping out off-road. Transmission cooler standard. What at first looks like too many buttons proves to be an intuitive, decent stereo system with iPod and USB inputs. In addition to the obvious Sat/Nav — easier to read than the Accord's — the interior features all sorts of clever touches that will help make this an extremely practical vehicle. There are storage bins galore, the mid row seats slide fore and aft and split 60/40, folding flat, as does the rear bench. The rear view camera in the rear view mirror works well so you can watch people in the back enjoy the separate climate controls. Basically, everything needed to make family trips as stress-free as possible. What price utility? The Pilot carries 8 in safety, can tow up to 4500lbs with no modifications, can haul plenty of stuff inside, is good to drive, and for its size offers decent economy. There's probably not a more practical car on offer from the high $20ks to the mid $30ks. Not the sexiest car on sale, but it is one of the most practical. 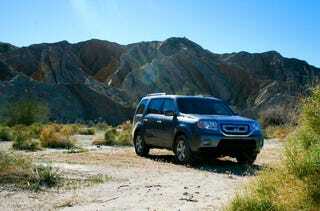 The Pilot competently goes where all SUVs and CUVs should go, but typically don't bother. Better to drive than most of the competition too, it nevertheless fails to set our fickle hearts on fire. Which is a shame. For us.